Can the Elan e34 recreate Mission's glory days? Energetic, punchy and involving, the e34 is a proper Mission speaker. Whats more, it impresses with all genres of music. Only the forward nature and the lack of true bass could put a few people off. Back in the 1980s and early 1990s, Mission had an excellent reputation for budget and mid-range rock speakers. Recently, though, Mission has no longer been the default choice for those seeking a punchy, exciting speaker. But now, under the ownership of audio giant IAG, the new Elan range seeks to win back some of that respect. Mission has already reinvigorated its high-end range with the Elegante and Pilastro models. These speakers use elegantly tapered cabinets with multiple drive units to great effect. Not surprisingly, the look of the Elegante has been used to create the new budget range. The company also has another aim with the Elan range: to bring back the Mission 'sound'. Well aware that previous Mission speakers may have sounded too polite, thus alienating traditional Mission owners, it has developed the Elan range to sound like Missions of old: this should mean a tight, punchy bass with excellent timing. A forward balance with strong projection and good treble detail are also traditional Mission traits. Mission calls it "enthusiastic vigour and liveliness", and has set out to achieve it in the following ways. First off... the drive units. The sheer number of the things makes this speaker look loud. The tweeter is a 25mm soft-dome design placed in a symmetrical position between the two main woofer units. The idea behind placing it here rather than at the top is to promote even dispersion of high frequencies. Topping and tailing the tweeter unit are two 125mm 'Paramid' woofers. These are constructed from Aramid polymer fibers sandwiched between pulp layers. The resulting material is light, stiff and has excellent internal damping characteristics. The last of these characteristics should reduce cone distortion, thereby improving the transparency and realism of sound. In addition to this, the woofers feature vented enclosures. Venting reduces air resistance, thereby playing a part in improving dynamics and timing. As you would expect from a modern speaker, both woofers are magnetically shielded. Beneath the driven part of the speaker lie three 125mm ABR (Auxiliary Bass Reflex) units. In addition to creating the visual aspect of power, they make the best use of the air within the cabinet by 'exhausting' it via passive cone movement rather than simple port extraction. Backing up this mighty driver array is an equally impressive cabinet. It's by no means the largest of cabinets, but the tapering effect gives it an aesthetic appeal usually only associated with more expensive designs. Of course, those sensuous curves aren't just about looking good. By flaring the speaker's sides, the front baffle can be made narrower whilst keeping the internal volume the same; this promotes improved stereo imaging. Curved internal walls also prove more effective at breaking up standing waves, thereby helping the speaker sound less boxy. The cabinet itself is made up of a multilayer composite of MDF and particle board that Mission calls Grania. The various densities of woods used are designed to absorb a wider range of resonant frequencies. The layers are glued with 'radio frequency activated' glue that, once set, is said to provide further absorption and excellent rigidity properties. The technology certainly sounds impressive and, by and large, the build quality and finish are excellent for a speaker of this price. Only the slightly ill-fitting vinyl wrap lets the quality of this speaker down - hardly a big issue given the value on offer. Mission has nailed it. For vitality, pace and sheer listener engagement, the Elan e34 isn't just reminiscent of Missions of old, but class-leading in its abilities. There's further good news in the e34's ease of placement and relatively benign amplifier load. Tried with a variety of amplifiers, the Mission worked consistently well. Similarly unfussy about placement, we found the best position to be about 20cm from the rear wall and ever so slightly toed-in. Power up and your first listen may not proceed as you'd expect. The real surprise with this speaker is that it doesn't sound as big as it looks. If you're expecting window-rattling bass, then you're in for a disappointment. In fact, the Mission sounds more like an accomplished standmount than a multi-speakered floorstander for much of the time - not that this is a problem, of course. Listening to The Cardigans' Erase and Rewind, the pulsating bass line is found to be a little lacking. That said, one can't gripe about the definition, timing or integration of the lowest frequencies. Apart from lacking sheer grunt, the e34 presents even the lowest registers with skill and dexterity. Furthering the e34's impressive performance is a coherent midrange and treble. Although forward in presentation, just as Mission desired, the percussion and the vocals are detailed, clearly separated and free from harshness. Moving on to rock, and The Jeff Healey Band found the e34 in fine form. The vocal presence is intense and engaging. The soundstage places the lead vocal not only squarely in the centre, but also at the correct height and well forward of the rest of the mix. The sparkling guitar has great attack and the timing of the percussion cannot be faulted at this price. There's also a great sense of focus and an overall composure that makes for a compelling listen. One of the concerns that potential Mission owners may have is whether this new-found 'vitality' will sound flat when the pedal's off the metal. Fortunately, when the volume is taken down from 11, and the pace lessons, the Elan e34 still proves to be an accomplished speaker. Although vocals may lack a little body by absolute standards, articulation and texture are excellent by class expectations. Whatever the genre, the e34 does a great job in capturing the mood and atmosphere of music. Backing vocals are well layered, and no matter how complex the mix becomes, the e34 always manages to remain composed and in control. The same forward yet composed balance carries through with classical music. Whereas early Mission speakers were not known for their strength here, the Elan e34 proves surprisingly effective. Put on something like Mendelssohn's Piano Concerto No1 (CBSO, Hyperion label) and, with Stephen Hough at the keys, you'll find the Mission gives an electric performance with all the vitality and pace that was present with other genres. True enough, piano timbre is a little lacking in body, but we can't think of another similarly priced rival that's any better here. Nor are there many that could better the scale or sheer precision of that sublime soundstage. While not being without fault, the Elan e34 succeeds in revitalising the Mission spirit of 20 years ago. This is quite an achievement, yet what really impresses is just how few compromises this has entailed in other areas. 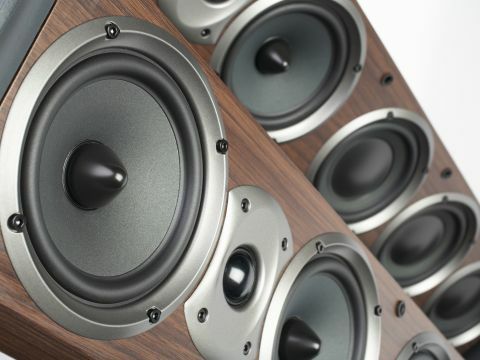 Quite simply, the e34 will prove to be a consistently enjoyable speaker, whatever the genre. With talent like this, Mission is back on form and clearly deserving of a Best Buy tag.